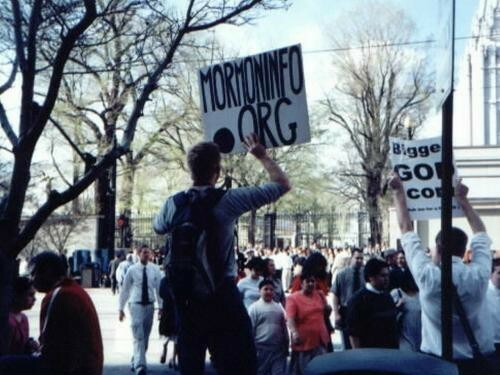 MormonInfo.org - FAQs - Why must you preach and hold signs when you minister in front of the temple? Again, the simple answer to this question is: because I like to, and I fail to see what is wrong with it. But in addition to that, I also believe that this is the most effective use of my time in getting the word out to as many people as I can. By definition, anyone who does monologues and holds up signs will be able to reach more people with the gospel than someone who is resolved to simply have dialogues or pass tracts out to people. And the person who God uses to do the former will naturally have more people changed by the gospel than the latter will. That is just a fact. Dialogues are far and few between, and not many people will take tracts. Everyone, even in cars that pass by, see the signs, and people within ear shot will get confronted with the truth whether they like it or not. I really believe in the transforming power of the word of God. The word of God won't return void, but it will accomplish what God has sent it out to do (Isaiah 55:11). The word of God is described as a seed that is thrown out on all sorts of soil (Matthew 13:18ff.). Hebrews 4:12 says that the word of God is "powerful," "sharper than any two-edged sword," and "a discerner of the thoughts and intents of the heart" (King James Version). It is this mysterious power that changes minds and hearts. That is why 1 Corinthians 1:21 says, "[I]t pleased God by the foolishness of preaching to save them that believe." Raising one's "voice like a trumpet" as Isaiah did (58:1), and holding up signs are simply means to get the word out to more people. It has nothing to do with hate. Quite the contrary, it has everything to do with love, because these approaches are means in which more people may be saved. Finally, it should be noted that I also engage in conversations with people and pass tracts out in addition to preaching and carrying signs. I am a flexible evangelist, open to a variety of ways to reach people.